Traditional communication strategies become less effective in forming consumer engagement. As the way we communicate changes, an increasing number of companies are breaking into movie marketing. “Branded movies” are especially unique in that they are committed to produce value for consumers with the power of storytelling and entertainment while reflecting on a brand’s philosophies and ideas. SSFF & ASIA launched BRANDED SHORTS in 2016 to introduce successful branded works. 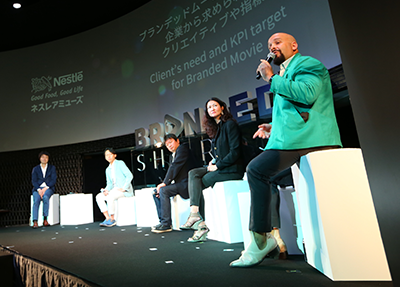 We aim to create the possibility of branded movies while consolidating its position as the only international festival for advertising works in Japan. This is a competition for movies that are produced with the goal of communicating with customers, as well as promoting the brands of companies and organizations, otherwise known as branded movies. Out of about 350 entries, 14 are nominated for the International category and 14 are nominated for the National category. Academy Awards® qualifying short film festival and one of the biggest short film festivals in Asia, SSFF & ASIA evaluate branded movies according to seven criteria: Cinematic, Storytelling, Emotional Appeal, Idea, Originality, Production Quality and Global Element. VR 360°In 2018, as the very first VR Competition at a film festival in Japan, "VR SHORTS" will focus on 360° films. A 360° world where viewers are provided with meaningful "experiences", and in a branded movie format too. We will screen one special program of branded movies that can be enjoyed immersively. Daihachi Yoshida was born in 1963 in Kagoshima, Japan. After graduating from university he started his career as a commercial director and filmed a number of short films including Every Boy Loves Airplanes, and Mitsuwa. In 2007, he was invited by the 60th Cannes International Film Festival Critics Week Program with his first feature film, Funuke Show Some Love, You Losers!. Later, he won the Best Film Award and Best Director Award with The Kirishima Thing (2012) at the 36th Annual Japan Academy Awards. On its 38th edition, he was nominated for the Best Director Award for Pale Moon (2014). His other films include The Wonderful World of Captain Kuhio (2009), Permanent Nobara(2010), and A Beautiful Star (2017). His newest film The Scythian Lamb (2018) won the Kim Ji-seok Award at the 22nd Busan International Film Festival. Born in 1964 in Kumamoto, Kundo Koyama started his career as a scriptwriter while he was studying at university. 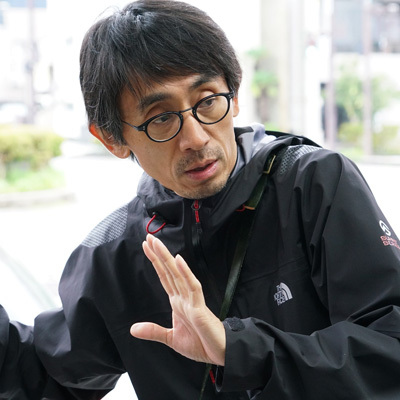 He has worked on many innovative TV projects including “Road to Canossa” and “Tokyo Wonder Hotel”. He also worked on “Iron Chef” and “TORISETSU”, which have been nominated for international Emmy Awards. 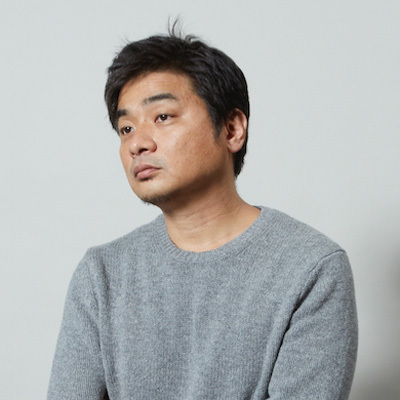 His first film as a screenwriter, “Departures”, won Screenplay of the Year at the 32nd Japan Academy Awards, as well as Best Foreign Language Film at the 81st Academy Awards®. 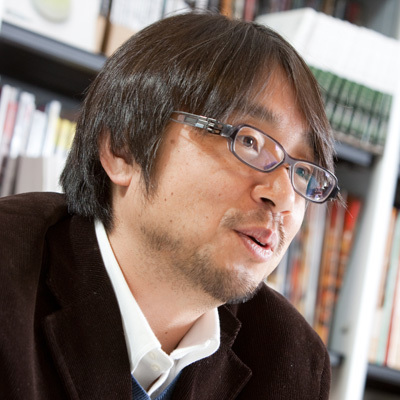 While being active as a writer, he also serves as the President of the Art Department at Kyoto University of Art & Design, and a Regional Project Advisor for Kumamoto Prefecture. Rika Shiiki　President and CEO of AMF Inc.
Rika Shiiki was born in 1997 in Chiyoda-ku, Tokyo. When she was in the ninth grade, she founded AMF. She is studying literature at Keio University, and is one of the 80 leading high school and junior high school students who is part of “JCJK Researchers”. They work in marketing research and offer advice to national clients. Not only is she an entrepreneur, but she also appears in various media publications as a representative of the young generation. 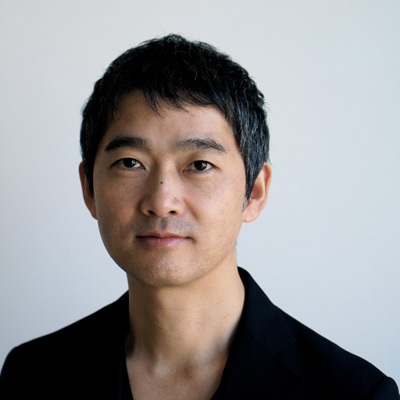 Takuma Takasaki　Executive Creative Director, Dentsu Inc.
Takuma Takasaki is Executive Creative Director at Dentsu. He has been named the prestigious Creative Person of the Year by the Japan Advertising Agencies Association twice in 2010 and 2013. His work crosses the borders of advertising and has been recognized at Cannes Lions, One Show, ADC of New York among many other awards. Under his leadership, his teams have created extremely successful campaigns for clients such as Suntory, East Japan Railway Company, and Toyota. He is the author of two books, as well as the scriptwriter for the movie ‘Honokaa Boy’(2009),　and a Japanese TV drama series. Since Fumitaka Takano joined ADK Tokyo, he has been involved in numerous campaigns for major brands such a Toyota, Air New Zealand, Ikea, Mondelez and many others. As a creative director and a communication architect, that builds the entire campaign from strategic planning through creative execution, Fumitaka is integrating film, interactive, branded content and PR into campaigns that produce results. In 2014, he made up digital creative team ‘NOIMAN’ within ADK Tokyo pursuing innovative approaches. Fumitaka’s work has been recognized at the Cannes Lions, Spikes Asia, The One Show, New York Festivals, Adfest and so on. He has also served on the Cyber jury of Cannes Lions 2016, Promo & Activation jury of Cannes Lions 2014. 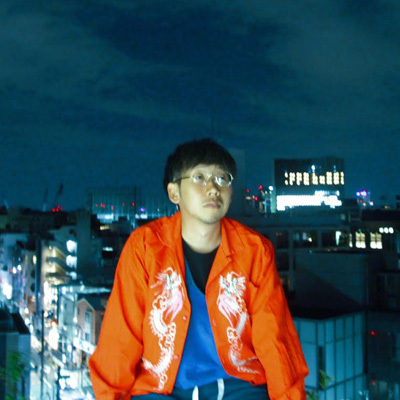 His original short film ‘Kakuzato’ was screened in Japan & Asia selection at Short Shorts Film Festival & Asia 2012. Morihiko Hasebe　Executive Creative Director, Hakuhodo Inc.
After graduating from Gakushuin University in 1986, Morihiko Hasebe began working for Hakuhodo Inc. as copy writer and CM planner. As Creative Director, he has created world-wide promotional campaigns and has served on the jury for Cannes Lions, Spikes Asia, AdFest, One Show, D&AD, Dubai Lynx, and AD STARS. He directed his 1st theatrical release film in 2014 which won awards at festivals around the world including the Canada International Film Festival. Chie Morimoto is the President of goen°, a Communication Director, Art Director, as well as a visiting professor at Musashino Art University. After graduating from Musashino Art University in 1999, Chie started her career at Hakuhodo Inc. She became the youngest ADC member in 2006, and in 2007, she founded goen°. 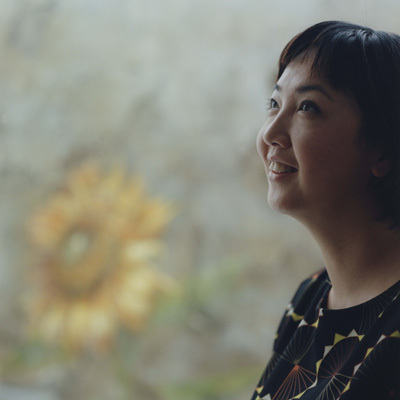 Her works are very diverse, including various NHK TV series such as “Gou”, “Teppan” and “Hanbun aoi”, as well as corporate advertisements for Canon, KIRIN, art works for musicians such as Yumi Matsutoya and Mr.Children, art direction in various films and stage plays, and spatial direction in zoos and kindergartens. Chie was awarded her first Grand Prix at the ADC Award with Suntory’s commercial “Uta no rire- (Singing Relay)” in 2011. She has also received the Itami Juzo Award, the Architectural Institute of Japan Award, Nikkei Woman of the Year 2012 and many more. Born in 1982, Show Yanagisawa graduated from Tama Art University majoring in oil painting. He is being represented by THE DIRECTORS GUILD of Japan. 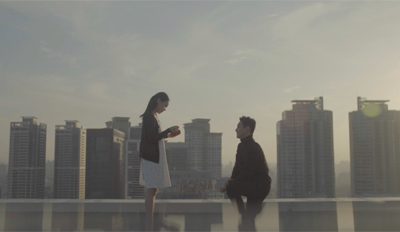 He consecutively received Gold awards at The One Show, Cannes Lions and Clio Awards with “High School Girl?” (SHISEDO) in 2016 and “Gravity Cat” (SIE) in 2017. Among the numerous awards, he also won the Grand Prix for Film competition at ADFEST. Internationally, he is represented by PRETTY BIRD (US), BLINK (UK), and INSURRECTION (FRANCE). Ū-ki Yamato received the Japan FIlm Professional Award for Best New Director in 2015. 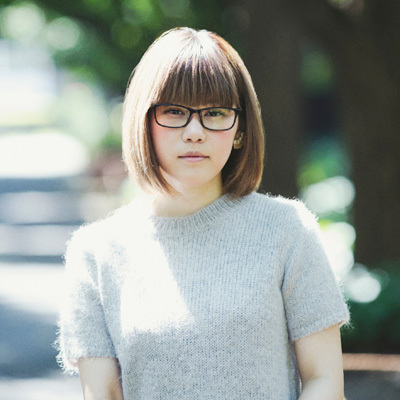 In 2016, she has been directing music videos for various artists such as idol group Nogizaka 46, Little Glee Monster and RADWIMPS, along with her secdond feature "Drowning Love," released nationwide led exceptional result. She has been also directing some branded movies for BOURBON and Kanebo. Judged on 7 criteria: Cinematic, Storytelling, Emotional Appeal, Idea, Originality, Production Quality and Global Element. We have gathered 9 jury members with different backgrounds to select the Branded Shorts of the Year for both the International Category and National Category. SUNRISE Company Limited, with their philosophy "make movies a communication medium,"specialize exclusively in cinema related advertising and promotional opportunities. 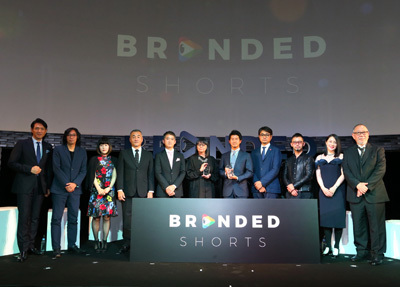 BRANDED SHORTS and SUNRISE intend to develop branded movies as "advertisements that move people", and which produce value for consumers with the power of storytelling and entertainment while reflecting on a brand's message. With this, the SUNRISE CineAD Award has been established, which will be awarded to the most cinematic branded movies. 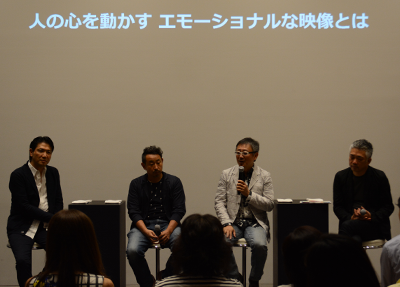 Considering that all conditions are satisfied, the winning work will be given an advertising spot and will be screened in cinemas across Japan. This award will be given to the best film made in abroad by 7 criteria-cinematic, storytelling, emotional appeal, idea, originality, production quality, and global essence. 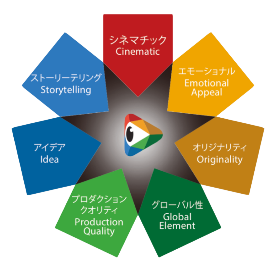 This award will be given to the best film made in Japan by 7 criteria-cinematic, storytelling, emotional appeal, idea, originality, production quality, and global essence. SUNRISE CineAD Award, which is established with SUNRISE Company Limited, with their philosophy "make movies a communication medium," specialize exclusively in cinema related advertising and promotional opportunities, will be awarded to the most cinematic branded movies. Considering that all conditions are satisfied, the winning work will be given an advertising spot and will be screened in cinemas across Japan (*). This event focuses on the power of storytelling in Branded Movies. Our guest speakers include Kamiko Inuyama, a jury member of BRANDED SHORTS 2017, the producer of prime-time TV show 'DOWN TOWN DX' Jiro Nishida, Creative Director of Dentsu Inc. Takatoshi Nakao and more. Nestlé Japan "Nestlé Theater" delivers content that can be enjoyed during down time such as Nestle's original films and short films from around the world. A special screening of carefully selected short films from Nestlé Theater will be held, along with a special talk session. This event focuses on the allure and possibilities of short films from various perspectives. Guests include Hitomi Kuroki, the director of "Wakareuta", which has been streamed at Nesthe Theater, LiLiCo and Tetsuya Bessho. 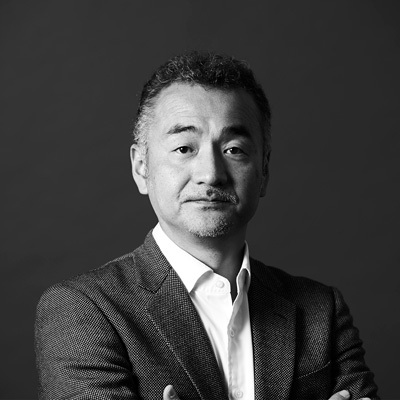 Kohzoh Takaoka, the President and CEO of Nestle Japan, a company at the forefront of video content marketing in Japan, will also give an opening talk. This event includes the Creative Seminar focusing on innovative creativity, the award ceremony of Branded Shorts of the Year and brand new SUNRISE CineAD Award, along with BRANDED SHORTS Jury Talk Session.